Our two day workshops are comprised of two short high-impact sessions designed to help you hit the ground running with Moodle and start building great learning experiences for your organisation. Which is ideal for LMS Administrators, Training Managers, Training and Development Managers, Teachers and Trainers or anyone who is supporting the adoption and use of Moodle at their workplace. Our approach to training is hands-on and task-driven. Drawing on our years of experience as a Certified Moodle Partner, we’ve built workshop content and practice scenarios based with real-life use cases that will sound very much like your own Moodle goals. Day One is designed to help attendees quickly develop the skills they need to successfully administer users and courses and improve the LMS experience for everyone at your organisation. On Day Two, you’ll build a course with the guidance of our in-house Moodle expert. 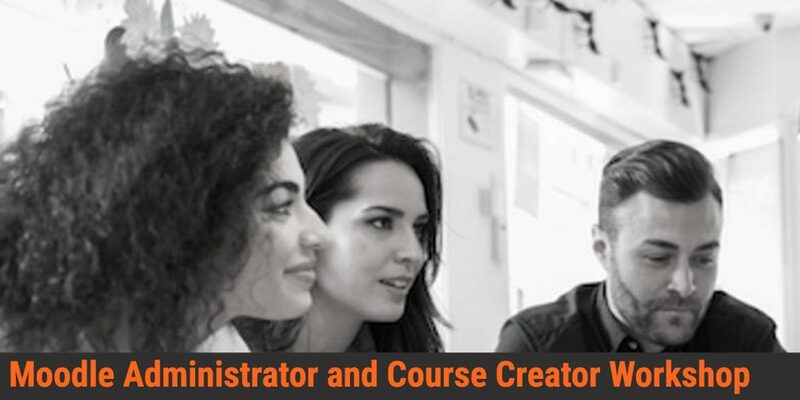 Walk away with an understanding of the tools available to course creators in Moodle as well as ideas and strategies on how to create the best student experience possible. Please note, this is not a free event. We are taking expressions of interest for this event. Once we receive a minimum number of expressions of interest we will send through further information for how you can a complete your registration and pay for this event. If an event is not going ahead you will be notified ahead of time that the event has been post-poned or cancelled. Should you have any questions please don’t hesitate to contact us on 1300 913 112. Bring your own device to this event and you will be given a wifi password on the day so that you can access the internet. Lunch is provided each day, a lunch voucher will be provided at the event. We also provide, coffee, tea and biscuits throughout the two days. Ticket sales will close 1 week prior to the event start date. If you wish to purchase last minute tickets please get in touch with us by emailing training@ecreators.com.au or calling 1300 913 112. In the unlikely event that this workshop is postponed or cancelled due to un-forseen circumstances we will advise you as soon as possible before the event is due to start. We will work with you to either reschedule your seat into the next available training session in your area or arrange a refund. We look forward to facilitating your training. If you have any questions or queries please don’t hesitate to contact us at training@ecreators.com.au or 1300 913 112.